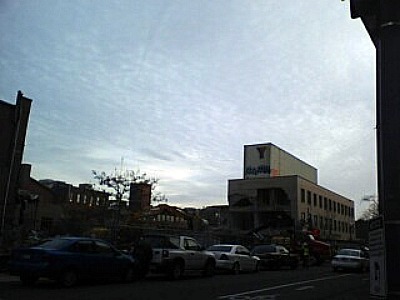 Walked by this morning and saw that construction crews are demolishing the old YMCA building at 14th and W. Apologies for the crappy picture, just had my cellphone on me. Glad to see redevelopment finally happening at this location, I look forward to it being vacant no longer. Walking by the other day I couldn’t help but notice the windows papered and a permit on the old Seafood & Crab joint. Prince of Petworth heard via a commenter that the space might become a Chicago hot dog place. I was unable to learn anything about the agents listed on the permit through Google. The Jenco Group is a real estate agency located in DC and I couldn’t find anything about Malligan Associates Limited Partnership. 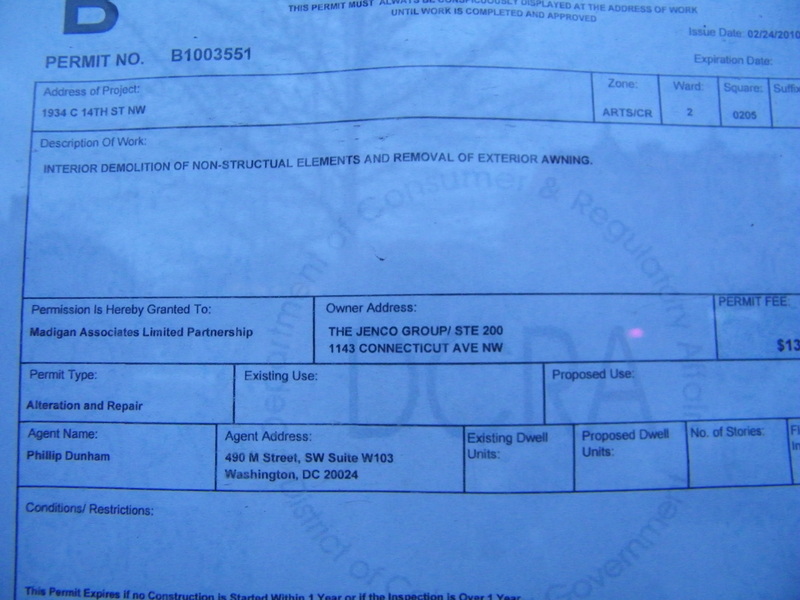 The permit is for interior demolition and removal of exterior awning. Walking by the other day, I noticed some guys in the old Pink November store on 13th and U doing something construction related. On closer inspection, the owners of the building, Robey Real Estate Enterprises (they don’t seem to have a website), have obtained a permit to do internal demolition for future renovation. This is good news, I think, and while I have no idea what the owners will use the space for, it’s good to see progress on an empty storefront on U street.